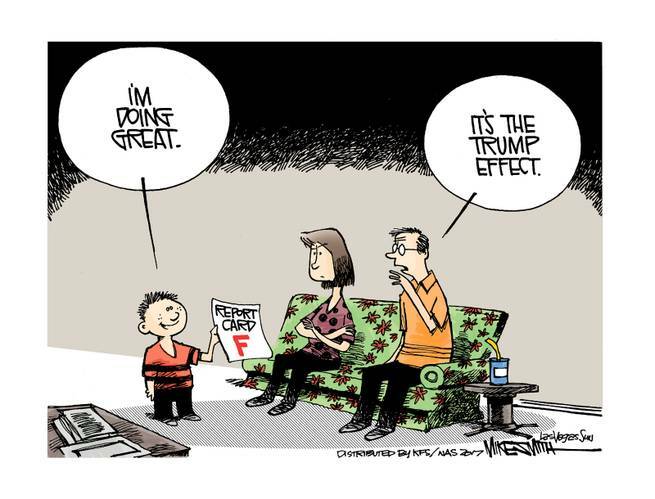 A recent editorial cartoon by Mike Smith in the Las Vegas Sun depicts a little elementary school boy showing his mom and dad his report card with a big “F” on it. “I’m doing great,” the boy declares. In Trump’s world – that is, the world of successful businessmen who create real jobs – getting an “F” really IS doing great. Let me explain. Back in 2011, long before Donald Trump was elected president, he co-authored a book titled “Midas Touch: Why Some Entrepreneurs Get Rich – And Why Most Don’t” with Robert Kiyosaki, author of the best-selling “Rich Dad, Poor Dad” book. In it, they explain what’s wrong with public education today, even in the “good” schools. Wrong, that is, for people who want to actually achieve the American dream of being their own boss and not have to worry about where the rent payment is going to come from next week. “If ‘A’ students are considered the smartest people of all, why don’t they all become extremely wealthy entrepreneurs? The answer is because most ‘A’ students are winners in the classroom where they win by making the fewest mistakes and failing the least. They learn that mistakes and failing are bad. Unfortunately, our schools generally teach kids how to be employees. But somebody needs to not only teach kids how to be entrepreneurs, but inspire them to do so. Otherwise there won’t be any jobs created for all those “A” students. And that’s exactly how the Trump effect is going to help make America great again. Three cheers for “failure”!